MIDIPiano is a free program for playing MIDI files or for recording your own tunes with its virtual keyboard. External MIDI devices are supported. Also available is the MIDIPiano Suite which includes a rhythm generator that allows to you easily create your own MIDI beats. These programs do not require installation and save their settings to an INI file. 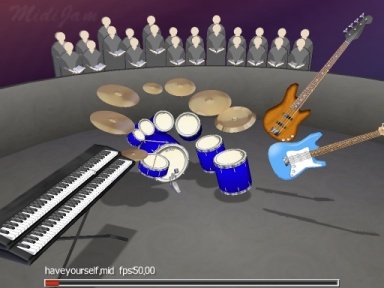 This is easily one of the best virtual piano programs I’ve found. When I got my first computer back in 1995, I remember looking for a media player that was better than the one that came with Windows. Back then I was really into MODs, MIDI files and MP3’s and wanted a player that could handle those files with ease. It was then I discovered Yamp(Yet Another Media Player), a free media player and one of the first that came with numerous skins that radically transformed the player’s appearance. It supports MP3, MOD, WAV, MIDI and other file types and installs buttons in the system tray so you can play your favorite tunes without it being in your way. I fell in love with it back then and still love it today.